← Stem Cells Center Opens New Center in Bolivia. The president has just returned from the UAE and Turkey with a smile on his face and the enthusiasm of those who believe he has found probable investors for Bolivia. Without a doubt, that would be excellent news. However, it is important to look at how the house is, so that those who visit it, with the intention of living in it, feel comfortable and have a useful stay. 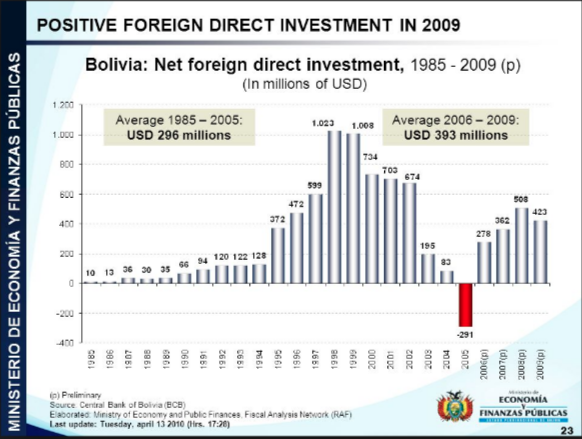 According to data from the Central Bank of Bolivia, foreign direct investment has been of 1,553 million dollars in 2018; That figure is the highest in recent years. In 2015, the country received 555 million dollars for this item and in 2016 only 335 million dollars were entered. On the other hand, South America received US $ 111,000 million in 2017. When the president introduces Bolivia to foreign investors, he tells them that the country can have direct access to the Atlantic; that is in the heart of South America and can be the link of a bioceanic corridor that benefits the entire continent in its relationship with overseas; He also tells them that there is a giant salt mine to exploit lithium or that the East has an incredible potential for production and export of food. Among other things, it also mentions that there are gas reserves waiting to be explored and exploited; or that there is varied mining. What the president does not comment is what the Bolivian businessmen and economists complain about. There is an unclear investment law, which keeps the State at the center of decision making to guide the injection of money. Nor does it mention that the Central Bank charges a 12.5% commission to foreign capital to get them out of the country. To this is added excessive bureaucracy, which determines that there is twice as many and even triple proceedings in relation to neighboring nations. Perhaps it has not been mentioned that there are quotas to export soybeans and other foods; that there is a band of prices or that some state companies compete with others in the private sector. The president was in the UAE and in Turkey promoting the country to attract investment. Why is that task not addressed daily by the ambassadors that Bolivia has in the world? Diplomatic representatives would have to seek fresh resources for the national economy, while opening markets for exports. That is a flaw that must be corrected. All Bolivians would like to smile and believe that foreign capital can come to invest in Bolivia. However, it is necessary to approve appropriate regulations that, at the same time, make us competitive with other countries in the region that do have a strategy and that generate growth from private national and international resources. It seems that, for them, the word ‘private’ is not antagonistic with State. Bolivian Thoughts opinion: El Deber captures the most important facts that display evo as just a lousy demagogue, authoritarian ochlocrat; evo has had absolute control over ALL State powers over the last fourteen years, where we experienced the highest ever possible remarkably high international prices on our exports, as well as loan forgiveness. He received all of those resources and managed to waste over $180 billion dollars, without generating a single sustainable job. nor invested in industries with value added to our raw materials. I would just like to add that as long as Bolivia continues to imitate Somalia, as long as road blockades cannot be eradicated, as long as narcotrafficking is seriously tackled as well as its primary component, the coca leaves … Bolivia will remain unattractive to foreign investment! This entry was posted in Bolivia, Business, Economics, Politics, Social Unrest and tagged corruption in public office, demagogue, Foreign investment, government failures. Bookmark the permalink.